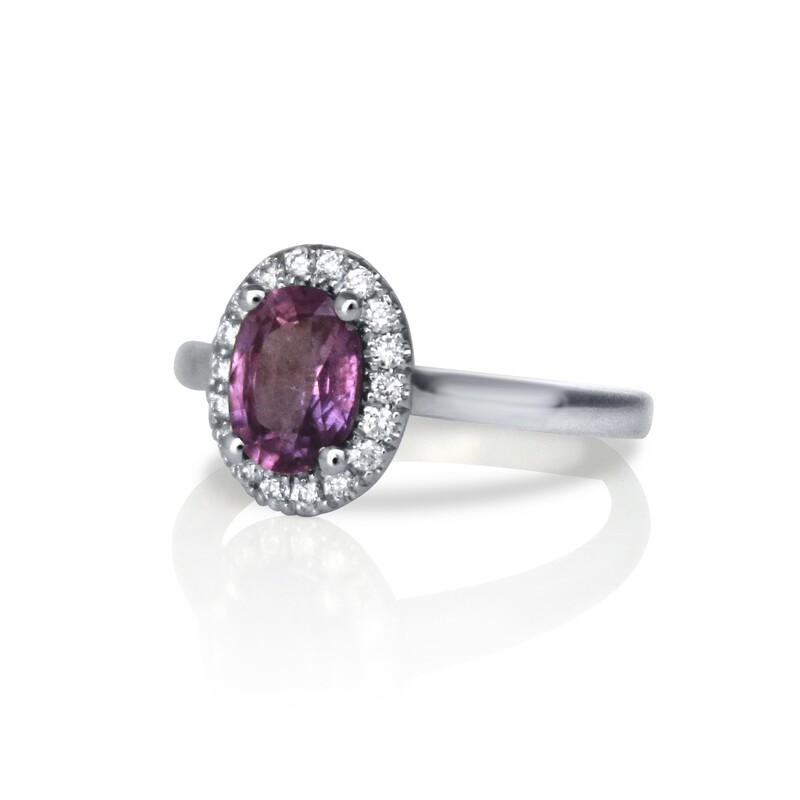 Purple sapphire engagement rings are rare, and we always feel lucky when we get the change to make them! 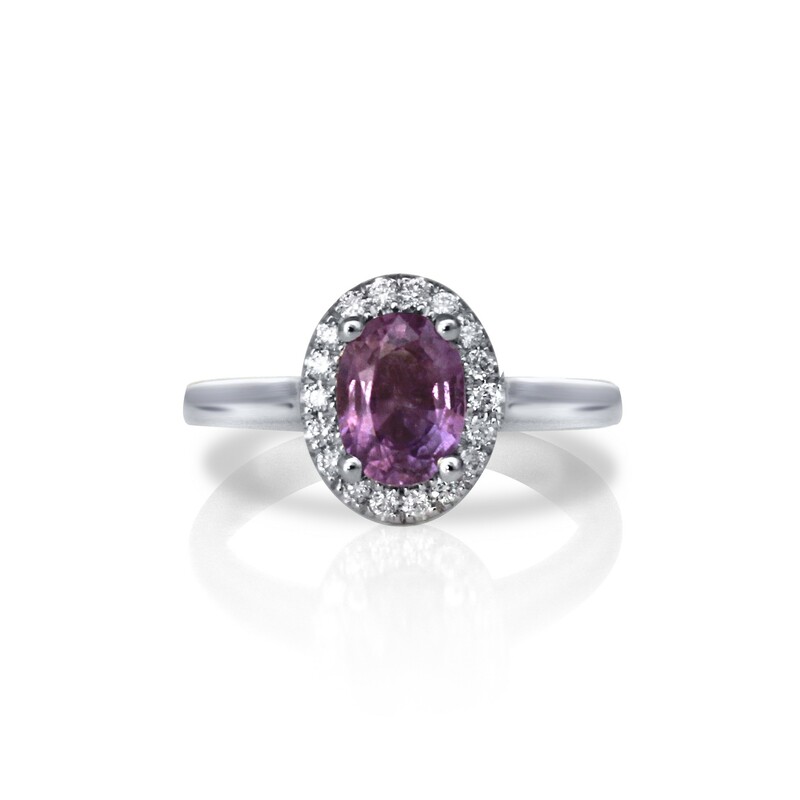 This custom-made purple sapphire engagement ring features a lively purple sapphire highlighted by a halo of diamonds. The client chose not to add diamonds to the band and that choice really makes the top of the ring stand out. We love the way the minimalist style of this purple sapphire engagement ring shows the sapphire off! Purple sapphires are rare and beautiful, resulting from a combination of titanium and chromium being present in the earth in the environment where the sapphire crystal grows. When those elements are present in the right balance, the resulting purple colours are varied and wonderful. We were really excited about the way the diamond halo brings out the liveliness of this purple sapphire - the proportions worked beautifully such that the combination of the purple sapphire and the halo make magic together. If you are interested in a custom designed sapphire engagement ring, we'd relish the privilege of sourcing the perfect purple sapphire for you. Finding the perfect purple sapphire for a custom engagement ring is especially fun because each gemstone has a different colour and cut that makes it unique. Unlike with diamonds, it's rare for two purple sapphires to look exactly alike, and as a gemmologist, Tamara (our chief goldsmith and jewellery designer) could look at them all day. We spend as much time with our clients as it takes to find the perfect gemstone and to consider design options and personalization that will make your sapphire engagement ring a truly special custom piece.